The first big occasion that I remember at the beginning of this fascinating journey through life was when I was taken by my parents, from forty nine Cotswold Gardens, to the Bristol Royal Infirmary to have my adenoids (tonsils) removed, on the Ears Nose and Throat Ward (ENT). I was only about four years old at the time but it will always be ingrained on my memory. I can still remember being taken down to the operating theatre, on a small trolley, by a very friendly and talkative porter who I realised in later years was doing his best to take my mind off of the impending operation. When we arrived at the theatre I was wheeled in and met by several people in white coats. After a while a metal object was placed in my mouth to keep it open then a pad was placed on top of this and a quantity of ether was administered to render me unconscious for the operation. There were no needles to inject the anaesthetic into you in those days. As long as I live, I shall never forget the smell of the hospitals back then. The next thing that I remember was when I came out of the operation, I was back on the children's ward. My throat was very sore, and the pillow on my bed was blood stained. This soreness stayed for about three days, in which time I was fed on a diet of jelly and ice cream until the soreness had subsided. My stay in hospital must have been during late spring or early summer, because I vividly remember that some of our cots and beds were wheeled out on to the veranda for a few hours a day. I don't recall having any visitors during my incapacity or if my parents just came to collect me when I was well enough to return home. What I can't understand is that during my stay in the hospital I always had a fear of anybody in white coats. Whenever I saw a man in a white coat I always pretended to be asleep, I don't know why. Perhaps my shyness was apparent even in those early days. All I know is that I was very glad to be back in Wotton-under-Edge. I have been told that I remained a rather sickly child for the next year to eighteen months. Catching colds and other bugs and not being able to throw them off. In nineteen forty six dad was demobbed from the army, where he had served with the Royal Electrical and Mechanical Engineers (REME) as a despatch rider, serving in the Middle East and in India. On his return home he brought with him a large quantity of oranges, obtained in Palestine on his way home from India, and pears. After several weeks of him being home and I consuming lots and lots of fruit they tell me my health seemed to improve quite significantly. It was only in later years that I discovered, by constantly questioning my parents, how urgent and serious my condition had been prior to being taken to the hospital in Bristol. My ensuing health problems, over the coming years, were brought about by the over activity of the pituitary gland. Situated at the base of the brain, this over activity resulted in an excess of growth inducing hormones. Which in turn brought about an enlargement of my bodies' extremities, and also affected my eye sight and gave me hearing problems, the result of which you see before you today, all six feet five inches of me. Fortunately, since my teenage years when the doctors and specialists were very concerned – as to my rate of growth – at one time they were worried that the growth rate might kill me if it continued, the condition has now stabilised, this is something I have to be grateful for. The medical name for my condition is 'acromegaley', my case is a very mild form, compared to some of the cases that I have heard of or read about. For a while, after convalescing, I found it very difficult to go out and play with the other children on the estate. I just wanted to stay at home. I did continue to go to school though, but all I wanted to do at night was stay in doors. Eventually, after much persuasion from family and friends I resumed my outdoor activities. By the following Christmas all thoughts of hospitals and operations had been forgotten and I gradually returned to a near normal life and started my first session in the academic world, at the 'Blue Coat' in the capable hands of Miss Hardy. I then had a couple of years at the 'Bear Street' school before we moved to Dursley. 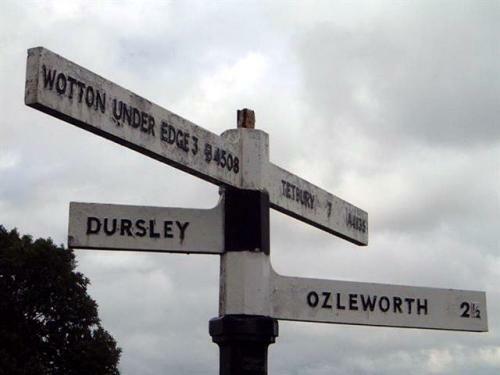 Although I hated the move to Dursley I still kept in touch with old friends and neighbours. I even attended a couple of 'Chipping', 'Bluecoat' and 'Bear Street' school reunions in Wotton, at the Town Hall and at the Civic Centre. These reunions were for ex-pupils of the above schools and organised by a group of volunteers led by an ex-Wottonian and his brother, namely Gordon and Nelson Perrett. Although I was privileged to serve on the committee for a couple of years, we found it necessary to disband the committee as we were unable to find younger volunteers to help with the hard work that goes into running such an event. Such a shame, but in the hustle and bustle of the modern world nobody seems to have time for the things that really matter!